Speaker Nancy Pelosi has written President Trump to suggest his annual State of the Union message to Congress be delayed until the partial government shutdown ends. The annual State of the Union message to Congress may be the latest casualty of the partial government shutdown. House Speaker Nancy Pelosi, D-Calif., sent a letter to President Trump on Wednesday, suggesting a postponement until after the shutdown is over. The speech, which the president would deliver to a joint session of Congress and a national broadcast audience, was originally scheduled for Jan. 29. The shutdown, now in its 26th day, affects nine government departments, including the Department of Homeland Security, of which the Secret Service is a component. Secret Service agents and other federal law enforcement officers have been working without pay since the shutdown began last month. 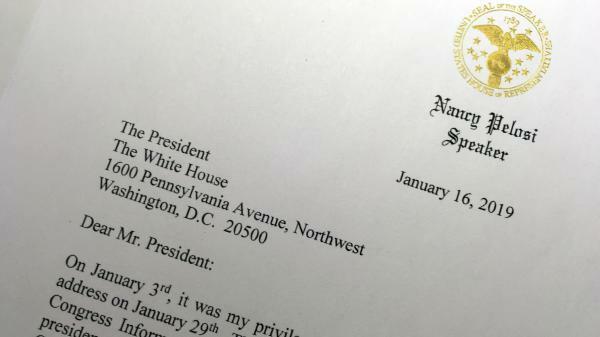 In her letter, Pelosi wrote, "The U.S. Secret Service was designated as the lead federal agency responsible for coordinating, planning, exercising, and implementing security for National Special Security Events." She added, "However, both the U.S. Secret Service and the Department of Homeland Security have not been funded for 26 days now — with critical departments hamstrung by furloughs." Pelosi continued, "Sadly, given the security concerns and unless government re-opens this week, I suggest that we work together to determine another suitable date after government has re-opened for this address or for you to consider delivering your State of the Union address in writing to the Congress on January 29th." Homeland Security Secretary Kirstjen Nielsen brushed aside Pelosi's security concerns, tweeting that "The Department of Homeland Security and the US Secret Service are fully prepared to support and secure the State of the Union. We thank the Service for their mission focus and dedication and for all they do each day to secure our homeland." House Minority Leader Kevin McCarthy, R-Calif., said, referring to Pelosi, "It's not a security issue; it's politics and she knows it." And House Minority Whip Steve Scalise, R-La., said in a statement that "now more than ever, our leaders from both parties should all gather together in Congress to hear the state of our union from our President." He also tweeted, "What are Democrats afraid of Americans hearing? But House Homeland Security Committee Chairman Bennie Thompson, D-Miss., said because of the "Trump shutdown," the Secret Service is not fully operational. "It would be completely inappropriate for President Trump to further deplete the agency's resources and manpower for the sole purpose of having an hour of uninterrupted prime-time television coverage," he said. Working together as Pelosi suggests has not been a simple or productive exercise between congressional Democratic leaders and the president as they try to resolve the standoff over Trump's insistence that any bill to fund government include $5.7 billion for a border wall and Democrats' continued opposition. Trump walked out of the last meeting he had with Pelosi and Senate Minority Leader Chuck Schumer, D-N.Y., and no Democrats attended a meeting between Trump and rank-and-file lawmakers at the White House on Tuesday.